The Ultimate Survey Junkie Review: Spoiler It's 100% Legit! Taking online surveys is a great way to make some extra cash. The problem is knowing which companies you can trust and actually earn money from. We have been getting a ton of questions about our list of the best paid online surveys. Today we are going to dive into our experience with Survey Junkie. Being money savvy we are always looking for ways to earn money online. One of our favorite ways, by far, is earning money while we watch TV using Survey Junkie. Pros vs. Cons of Survey Junkie? How does Survey Junkie pay you? And of course, we will share our own experience and screenshots along the way. 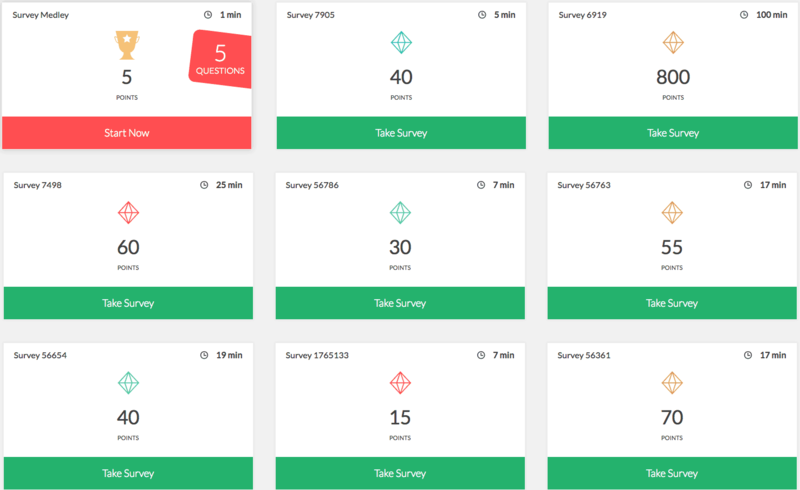 Who Can Use Survey Junkie? How Much Can I Make With Survey Junkie? Can I Trust Survey Junkie? 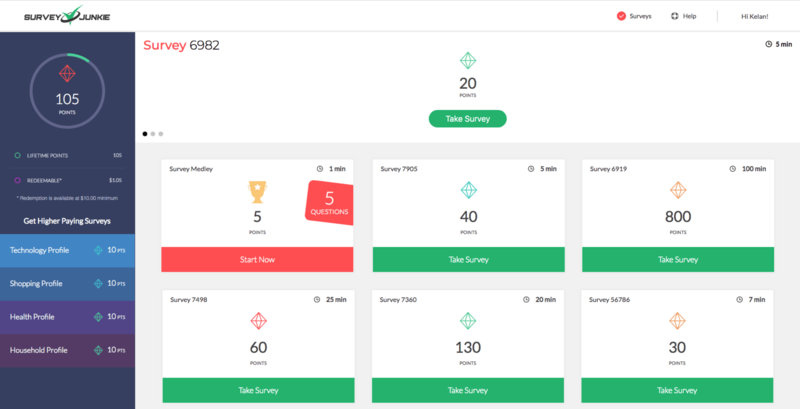 Survey junkie is a paid survey site with an online community with over 3 million members dedicated to making their voices heard. Right on their website it states “We open the window of communication between you and the brands you love”. Basically, they help conduct market research via surveys to help companies improve, optimize, and grow their brands. The best part is you can be a part of it and get paid! At the time of writing, Survey Junkie is only available to the United States, Canada, and Australia. The main reason they are limited to these countries is so they can provide accurate information to the companies they partner with. A majority of the companies they work with are located in those countries. It’s really that simple! But let’s dive a little deeper into how Survey Junkie is able to pay users (like you and me) by simply having us answer a few questions. 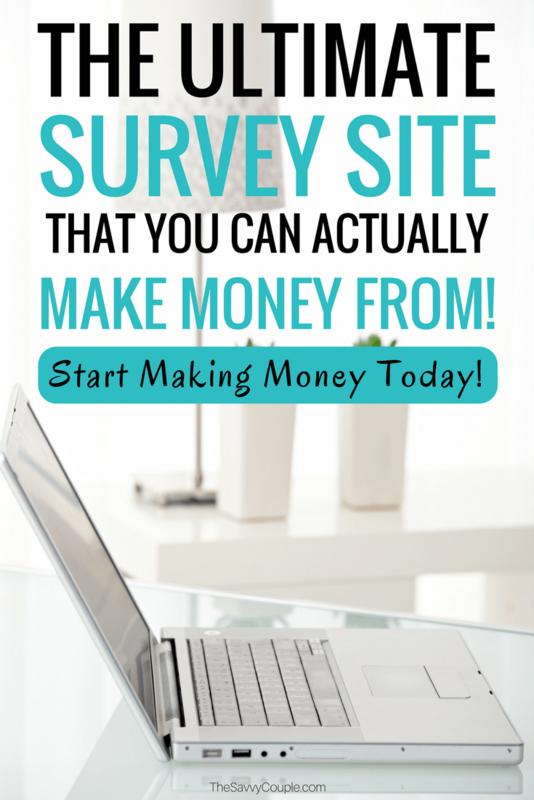 Just like many other paid survey sites, Survey Junkie is a market research company. They get paid by companies and brands to gather information on certain types of customers. The value these companies get from market research is enormous! They are able to better create, market, and sell their products and services. The reason market research works so well is because they break customers into categories. Putting similar customers in the same categories reduces the variables and increases the information they can gather. Boom, that was easy! When I signed up I used my Facebook profile and had my account set up within a matter of seconds. 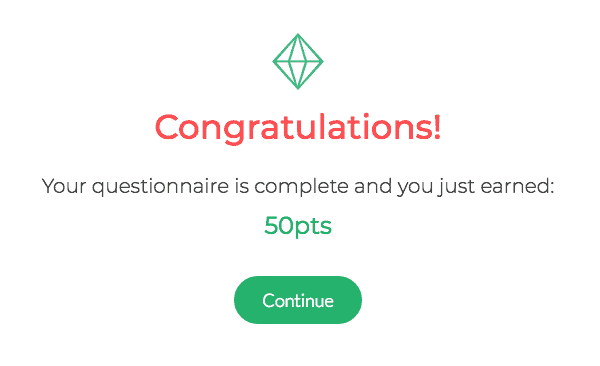 After answering a few more questions (like I mentioned above) I had already earned my first 50 points. I continued to confirm my email and take a quick tour of the dashboard and already earned over $1 in what seemed like less than 3 minutes of time. The dashboard is beautiful, clean, and super organized so you know exactly what everything means. Obviously, this is one of the best benefits of doing online surveys. You get the freedom of completing on your own time, no obligations ever. In the dashboard, you will see a handful of surveys that you are able to click on to get started. These are just a handful of the surveys that were offered to me right after I signed into my account for the first time. Once you click on a survey you will be asked to answer a few short qualifying questions. This ensures the company doing the paid survey is getting the customers they are looking to gather information from. This is exactly what we mentioned above about putting people into categories. Sometimes you will get denied but most of the time we found that you won’t be wasting time getting right into the paid surveys. These qualifying questions make sure you are the correct match for getting you started. A good thing to consider doing once you start taking surveys is filling completely filling out your profile. As you can see the more complete your profile is the higher your chances of receiving higher paying surveys. 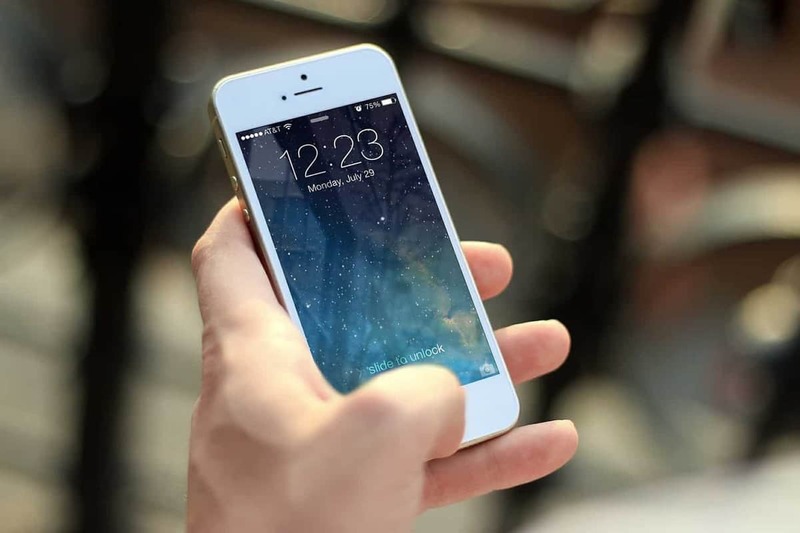 Once you start completing surveys your points will start to gather quickly. It was always a nice feeling after finishing a paid survey to see confirmation that I earned the rewards and saw them go directly to my account. 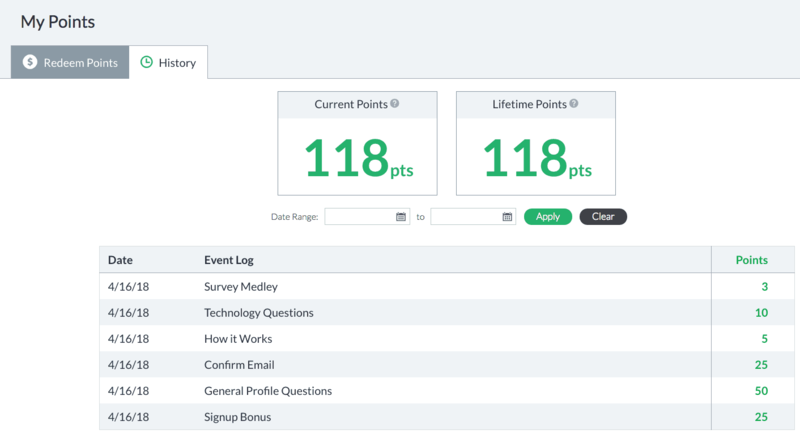 Here is a close up picture of the dashboard showing your total points. Survey Junkie makes redeeming your money as simple as possible. 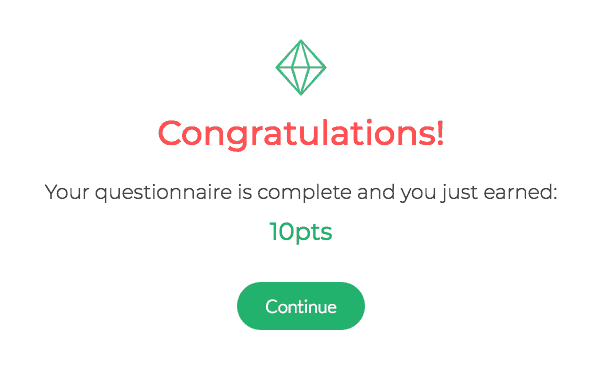 Once you earn 1,000 points (equal to $10) you simply request a payout. You have the option of PayPal or e-Gift Cards as your payment option. We also liked that Survey Junkie had a “history” screen. It’s another feature that makes Survey Junkie stand out as one of the best-paid survey sites around. You never have to guess again which surveys you took paid what amount or if your running total is correct. Being completely honest taking online paid surveys is not going to make you rich, it won’t replace your income, and you certainly will not be able to pay your mortgage with it. You can earn extra income to pay off your debt, save for retirement, or help pay for a nice vacation. Survey Junkie is a great option for those looking to earn extra income on their own schedule. Most of their surveys take between 5-25 minutes and pay out anywhere between 10-100 points ($.10-$1). This works out to be around $3-$7 per hour. Plus your points will never expire as long as you take at least one survey in a 12 month period. Yes! Survey Junkie has been in business since 2013 and has a huge user base of over 3 million. They are extremely transparent in everything they do. We have yet to come across any of our readers that had a bad experience with them. 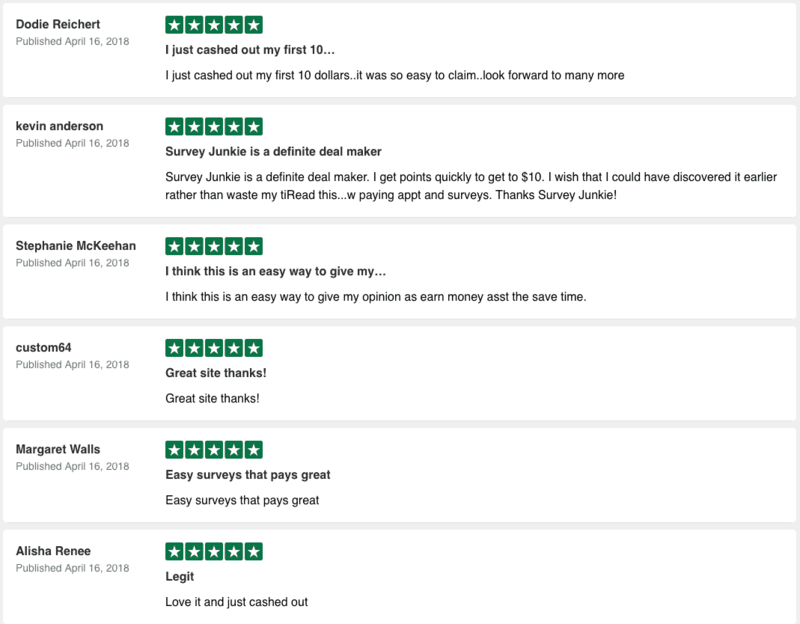 Here is a screenshot of the most recent testimonials on the Survey Junkie site. If you are looking for a legitimate high paying survey site to join Survey Junkies is an amazing option. With a simple and easy to use interface anyone can get started with them making extra money. We have personally tested dozens of paid survey sites and Survey Junkie time and time again comes out as one of the best sites. Sign up today and get started! What is your favorite paid survey site?